Could Wikileaks herald a new era of truth? In universities across the land students and lecturers will now begin hammering out Dissertations and Thesis’s on the now historic New Labour era (1997 – 2010) in British politics. But the focus won’t be on policy or even political achievement. It will be on legacy, namely that of the two most prominent architects and leaders of the New Labour movement: Blair and Brown. The reason for introducing this blog post in such a fashion is to make clear that no article could summarise the friendships, foes, battles, comparisons and contrasts between the Blair and Brown premierships. Labour by nature tends to end up bitterly divided during their spells in Government. 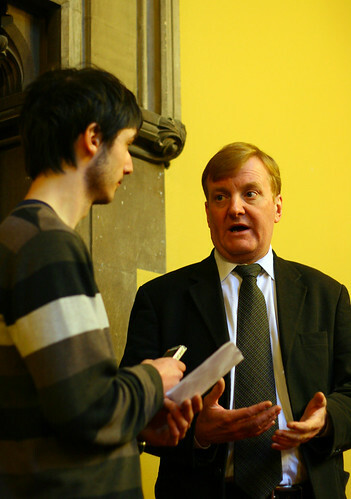 The last ‘Labour era’, or rather Wilson and Callaghan years, were characterized by disagreement – over Nuclear proliferation, Europe, the economy and even Scottish devolution. That was a time primarily of policy division. This time, it is a clash of personality – Blair and Brown are chalk and cheese and have left a lingering tribal legacy in the party of Brownites and Blairites. So how will history judge their reigns? There are difficulties in drawing parallels as Blair enjoyed a decade in power on the back of a very strong British economy, party popularity across the regions of Scotland, Northern Ireland and Wales thanks to devolution and for the most part, media adoration. Brown on the other hand didn’t even make it 3 years – half a Prime Ministerial term to be precise. He inherited a country on the edge of the deepest recession in decades, a party bitterly divided and unpopular. It didn’t help either that the media turned on him in a very personal and undignified manner. The House of Commons has been hung out to dry. Perhaps you’re reading this full of anger and dismay at the situation – our nation has no leader, our country and currency is doomed. Or maybe you’re a little more like Ian Hislop or myself. You feel like dancing and that this is exactly what the people wanted i.e. none of the above. The fact is, this British election result is one of the most democratically sound outcomes for decades. Even with Clegg-Mania, the political academic in me still predicted a commanding Cameron victory or even a Conservative landslide. But the result… is just about exactly what I hoped for. The British electorate has proved everyone wrong and should be immensely proud. Go on, whoever you voted for, pat yourself on the back. You know deep down, Cameron and Brown were both not what you wanted (especially post expenses) and now you get to sit back and watch them squirm. On the front of the Newspapers today, the images were tremendously enjoyable. Seriousness of occasion aside, the leaders of the three main parties standing there, faces looking dreadfully unhappy, under a lot of pressure. The public, with no idea what’s going on inside their heads, can be rest assured, a Hung Parliament is an appropriate punishment for all the corruption of the past year. Today, I leafed through the Guardian’s Weekend magazine towards their exclusive ‘once in a decade’ Jonathan Ross interview with an apathy that would make even the British electorate proud. I didn’t expect to read anything remotely interesting or intelligent. And then, somehow the infamously childish chat show host surprised me with a few sharp insights (amidst a vast puddle of cringe). First, was the commonly held view that everyone has ulterior motives under the spotlight of publicity: the reason Ross cites for choosing not to give interviews over the last 10 years. I was already planning a blog post on that very topic, albeit more political. The business leaders such as Richard Branson and Stuart Rose who have come out in force this week to declare their opposition to Labour’s planned rise in the National Insurance rate are not saying so because it benefits the country. Rather it benefits their collective commercial pocket and they hope to convince everyone else to vote against it. But it isn’t just businesses who declare their electoral position on the basis of self-interest. Everyone does – whether media organisation, charity or politician. He may hardly be an objective source himself but Ross is right. The BBC has a reputation for impartiality but their practice can be dubious during election time. They will want to be looked upon favourably by the incoming Government given that their funding is reliant upon the public purse. So, when you’re watching BBC news (or ITV news or Sky news) over the next month, think about what you’re seeing. Don’t just watch and absorb everything. Critically analyse it. Whether you read the Daily Mail, Guardian or Times you should be doing this. They all have political agendas. How do you do this, you might ask? Well the last few times I’ve seen BBC election coverage; it has been subtly obvious. The footage of David Cameron has always been energetically shot – showing him slamming a pool ball into a pocket or jaunting joyfully down an aisle of Sainsburys proclaiming the ‘trustworthiness’ of business leaders. Compare this with Gordon Brown’s photoshopped face being placed on a National Insurance card and the contrast of negative and positive connotations emerge. It’s not that the BBC are particularly biased – they do at least interview a member from each of the main three political parties and today’s coverage of the Conservative’s proposed marriage tax break was more balanced (though it is worth noting the order of who gets interviewed and under what conditions). But both the BBC and the aforementioned Business leaders are concerned about having a favourable relationship with the next Government and Prime Minister. David Cameron is pretty much a safe bet. The polls are swinging back to the Conservatives and there is no doubt media portrayal has an impact on this. You might read this article and argue, “of course the footage of Cameron is more energetic – He’s younger and has a more vibrant personality than Brown.” Think back to Tony Blair’s election battle with John Major though and you might realise it’s not necessarily about which party when it comes to media motive. Back then Blair was portrayed as the new young and energetic hopeful, contrasted with tired old Major. Cameron and Brown’s election coverage is Blair and Major all over again. The red and blue corners have swapped places but it is essentially old wine in a new bottle. And if you think it’s impossible to predict who will win a general election, then you should ponder upon why the Sun has successfully backed and forecasted the winner for the last 25 years. They say the media can’t tell us what to think but can tell us what to think about. Sometimes I wonder, although it seems the British majority tend to think voting isn’t worth their while. Maybe more than anything, media portrayals of political parties cause apathy. Given the number of times I’ve seen party leaders playing table tennis with a school child for the cameras instead of doing their job, it wouldn’t surprise me. How many ‘endings’ have there been to the Cold War? There was the symbolic fall of the Berlin wall in 1989, the disintegration of the Soviet Union in 1991 and perhaps almost as significantly as those 20-year-old events, 2010’s Strategic Arms Reduction Treaty (START). This new agreement between US President Barack Obama and Russian President Dmitry Medvedev may be a replacement of an old treaty but it brings with it an unprecedented landmark in international politics: the reduction of US and Russian nuclear warhead stocks by a third. Perhaps with this week’s news, Obama has finally sealed the envelope on the cold war. It may also signify a distance between the foreign policy of Barack Obama and that of George W. Bush. Above all, to the naked eye at least, it appears to set a powerful example to the world. 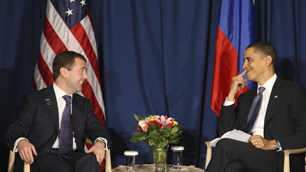 Let’s look at the positive first: Obama and Medvedev have turned the political hypocrisy dial down, just by a notch. Obviously they’ll still have about 1,500+ nukes each which is probably enough to blow up the world a few thousand times. In fact, scratch that – together they could turn an entire galaxy into dust. But it will give both nations some leverage in criticising any nuclear ambitions Iran might have. As the treaty’s acronym ironically states, it’s a start. Another positive factor is that the US and Russia might stop vetoing each other in the UN Security Council. It might help the UN increase its multilateral weight and perhaps with Iran there won’t be another Iraq. Perhaps Obama will use negotiation and soft power rather than the hard power, shoot first and ask questions later stance, of Bush. Perhaps the most powerful nations might start listening to each other, let alone the UN. Nuclear weapons are not just a phenomenal military offensive, but they’re the best defence. If Iraq had possessed them, Saddam Hussein wouldn’t have faced invasion because he would have held too much power. Obama and Medvedev know that nuclear warheads are the ultimate bargaining chip. Think of it like a game of poker, the more you have the stronger you are. Finally Russia and America might look upon each other more equally than before. But of course, let’s not get swept away by idealism here. There are ulterior motives, as in any political deal. Take Russia first of all. On the face of things they have more to lose – currently possessing 2,600 nuclear warheads next to the 2,126 Obama’s administration holds. But here’s the truth of the matter: Russia’s nuclear arsenal is set to reduce drastically over the next few years anyway due to ageing. Thus it is significantly in their interest to persuade America to reduce theirs. It’s no surprise then that Putin was one of the men in the background pushing this deal. It grants Russia a much greater sense of political weight in the international arena. What does Obama get out of it? A lot. His electoral popularity has been waning considerably due to criticisms of not being pro-active enough. This is his first major foreign policy achievement. Not only is it huge on a symbolic level, it comes across as the opposite of George W. Bush and reflects Obama’s newfound Nobel peace prize-winning credentials. It will now be considered harsh to blame Obama for doing little (Though people seem to have forgotten his Presidency has been somewhat strangled by the recession and the pressure of cleaning up the mess left behind by his predecessor). In one week, to have put through a health care bill that extends coverage to 30 million Americans and signed a treaty reducing the number of nuclear weapons in the world sends out a very powerful and positive message. Of course Obama has played the game of self-interest in this but that’s the definition of international politics. Ignore that and you will end up being walked over and potentially unelectable. Bush knew that and was re-elected. Obama knows it too but at least he’s done it with a social conscience and not as Putin put it, with reckless dominance. The media tributes to Michael Foot following his death last week could not ignore the mark of failure on the former Labour party leader’s lengthy yet controversial political career. Suffering the worst defeat in a post-war general election has been a central aspect of his reputation but it represented a much greater deficit for British Politics: the loss of the left wing. Foot was the last true old Labour politician to lead the party. He narrowly defeated Denis Healey to the leadership and stood firm on his socialist values amidst a wave of, at the time, unstoppable Thatcherism. He built a Labour manifesto that fiercely advocated nuclear disarmament, stronger trade union presence and withdrawal from the European Economic Community. This manifesto was nicknamed “the longest suicide note in history”, which is fairly fitting – Labour in the early 80s was in a dishevelled mess divided across many lines from the party’s ideology to its position on Scottish Devolution. Foot was in charge of an unelectable party despite some of the great principles he stood for. Following his defeat, Neil Kinnock took over and began uniting the party and the long-drawn construction of New Labour. The left wing in British politics has since died out, carrying a stigma wherever it goes, perhaps because Foot, despite his warmth, came across as so radical and barmy. He called Norman Tebbit a “semi-trained polecat”, wore a green duffle coat to a Remembrance Day service, criticised Thatcher for lacking imagination and declared that there was nothing wrong with being a Marxist. He might even have a few points there, but Foot was clearly a man strongly on the left – too strongly for his own party even as 4 members split to form the centre-right SDP in 1981. Foot’s eccentric attitude may have aided the media’s demonization of the left, especially following its association with the deep economic recession of the late 1970s and even communism (an extreme ideology far from centre-left principles). Today we have a situation in British politics where Labour, the Conservatives and Liberal Democrats are all clamouring around the centre right. Choice and democracy have become limited. Some voters may even still believe Labour is centre-left and yet again demonise a misplaced ideology in light of the current recession. But recessions will happen because of capitalism and excess, not as a result of ideology. Think of one of the last standing left-wing pillars of British society – the NHS. Yes, it has many problems but ultimately, it saves more lives than it costs. If the United States had an NHS, more lives would be saved. Free access to a GP for all, regardless of their birthplace or background – an enviable achievement. That is the kind of true socialist principle Michael Foot, and his close friend Aneurin Bevan stood for. I hope that such principles will one day return to British politics but as the old saying goes, they’re too expensive. I’d love to believe Labour’s new slogan, “a future fair for all.” But really, a slogan like that next to a party that has stood for anything but is going to ruin the left-wing’s reputation even more. Remember the gap between the rich and poor has widened under New Labour. It will probably widen further under any Tory Government. Michael Foot may well spend another 96 years rolling in his grave but he should never be a footnote in history.